SMAP SSS V4.2 accommodates changes in the underlying Level 1B-TB data resulting from the SMAP mission data reprocessing in June 2018. 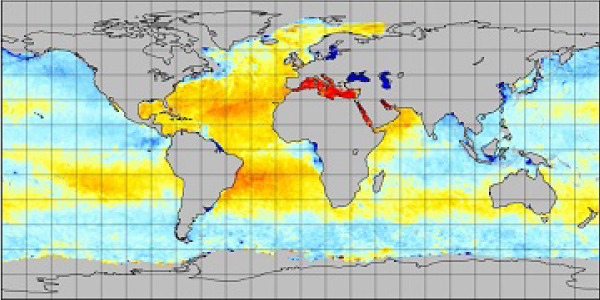 Updates with version 4.2 include: improvement in the brightness temperature (TB) calibration using an adjusted reflector emissivity, inclusion of a Sea Surface Temperature (SST) dependent flat surface emissivity model, use of updated land correction tables, and inclusion of averaged ice concentration ancillary data in the V4.2 datasets. Data begins on 1 April 2015 and is ongoing. Data sets comprising this release include the L2B orbital data and two L3 mapped, global coverage salinity datasets: an 8-day running mean dataset based on the repeat orbit of the SMAP mission, along with a monthly average dataset. The L2B data are provided on a 25 km swath grid while the L3 data are gridded at 0.25° x 0.25°. The spatial resolution of all four datasets is approximately 60 km. The L2B dataset is in HDF5 format, and the L3 datasets are in netCDF4 file format. All datasets are CF/ACDD metadata standards compliant, and include estimated SSS uncertainty fields. The JPL SMAP-SSS CAP V4.2 datasets are described and discoverable via the PO.DAAC data portal. The data can be accessed via PO.DAAC's public FTP site (Level 2 and Level 3 mapped) but preferentially via PODAAC Drive (Level 2 and Level 3 mapped) going forward given deprecation of PO.DAAC's public FTP site. The data are also accessible via OPeNDAP (Level 2 and Level 3 mapped), and PODAAC-WS, and are also be accessible via THREDDS and LAS. The SMAP Algorithm Theoretical Basis Document (ATBD), validation analysis and file specification document together with other primary technical documentation are available from the FTP site together with reader software. General information regarding the SMAP mission is available from the mission website and also via PO.DAAC's SMAP and salinity webpages. Comments/Questions? Please contact podaac@podaac.jpl.nasa.gov or visit the PO.DAAC Forum. NASA is in the process of deprecating the use of the FTP protocol for data and information access. PO.DAAC is pleased to offer PO.DAAC Drive as a robust FTP alternative for browsing and retrieving data at PO.DAAC (https://podaac-tools.jpl.nasa.gov/drive/). It offers file navigation and download through an interface served directly through your browser, and with a familiar look and feel. It also allows users to access data via a command line so that interactions can be easily scripted. The entire PO.DAAC archive can also be mounted to a local computer as a virtual data store.